I have the best brown pair and wear them constantly, don't they deserve a sister from another mister?! Mr Noir? ;) These are my current favs! If price wasn't an option which would you choose?! I want a pair with standing power, I don't want a one and done. I want these babies, like the other 2 pairs of boots i won to be coming back year after year!Which makes me love the LR's just the insty-bitsy bit less, because of the gold. I wish they were gunmetal or something! You pick!!! Love the Madewell ones..go for those! Ohhh, those Loeffler Randal ones are amazing–I want them! these are all gorgeous! i'm on the hunt for a pair myself and have my eye on a pair of sam edelmans. 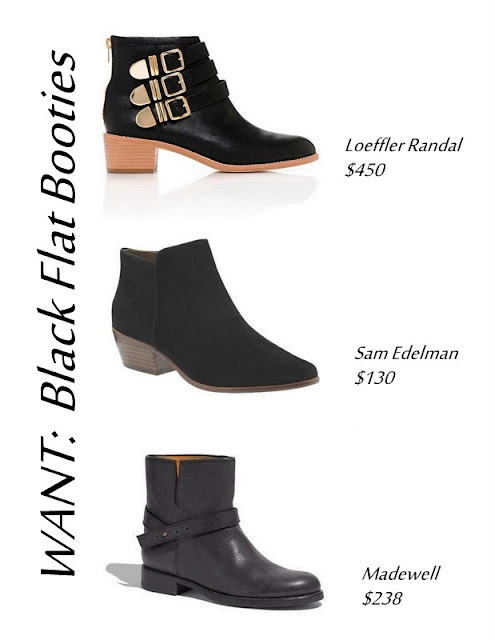 Love these low black booties! I need some and especially love any that are actually flats instead of heels:) Yippee!